Purpose: We studied 31 individuals whose femur or tibia was elongated with the PRECICE™ intramedullary lengthening nail in a protocol-controlled, multicentric, prospective series. Only skeletally mature individuals were included in the study. Materials and Methods: The protocol entailed 2-year follow-up after consolidation of the regenerate new bone in the distraction gap. Since the external remote controller (that powers the nail's internal rotating magnet) must be within a predetermined distance from the implant, body weight limitations applied to the individuals. Similarly, a history of active or prior bone infection in the involved limb segment, an offset medullary canal that could not be successfully reamed for the implant, an angular deformity that precluded insertion of a straight device, and any potential limitation on regenerate new bone formation (such as metabolic bone disease or vascular compromise) were causes for exclusion. The mean age ± standard deviation was 24.3 ± 15.0, and the median age was 18 years. There were 20 males and 11 females in the series, with 21 Caucasians, 5 Hispanics, and 5 African-American individuals. The mean body mass index was 24.2 ± 4.7. Twentythree (74.2%) cases involved the femur and 8 (25.8%) involved the tibia. Results: One participant died of medical causes during the study period, and one participant was lost to follow-up, but 29 of 29 participants followed at least to consolidation achieved union (100%) although one of these participants was treated with a supplementary cancellous bone graft and another participant was converted to trauma nail before consolidation, to permit full weight-bearing as a stimulus to regenerate consolidation. 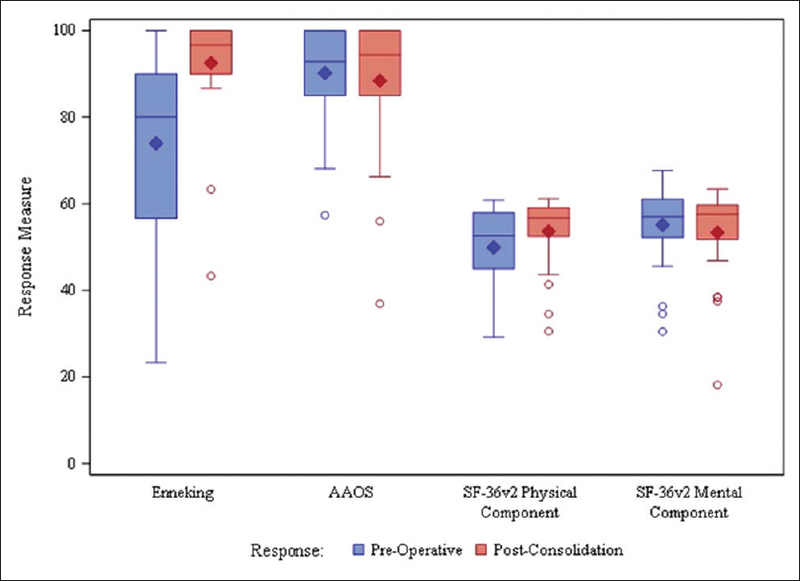 On an average, participants achieved 96.3% ± 23.2% of the preoperative target lengthening (3.5 cm; range 1.8–6.0 cm) over an average of 48.5 ± 15.6 days. The average time to full weightbearing (permitted when the regenerate was consolidated on three sides) was 141.1 ± 80.7 days. The knee joint, at consolidation, lost an average of 6.5° of flexion and 0.3° of extension. The ankle lost an average of 1.4° of dorsiflexion and 5.4° of plantar flexion. The hip joint lost, on average, 2° of flexion, and gained 1.6° of extension. There was one deep infection involving the implant, successfully treated with intravenous antibiotics and superficial debridement. Nearly 25.8% of the participants had pain issues during lengthening, often over prominent hardware. In one participant, the nail failed to elongate during lengthening at home and had to be exchanged. One interlock screw broke. The internal components separated during implant extraction in the one subject had his nail exchanged by a trauma nail. Only 17 participants exited the protocol by presenting to clinic for evaluation 2 years after consolidation. None experienced significant deterioration of outcome. Conclusion: The PRECICE™ IM nail is a well-tolerated, reliable, fully implantable limb lengthening device that will accurately elongate the femur or tibia in a variety of causes of limb length inequality, with a low implant failure rate, and few complications. 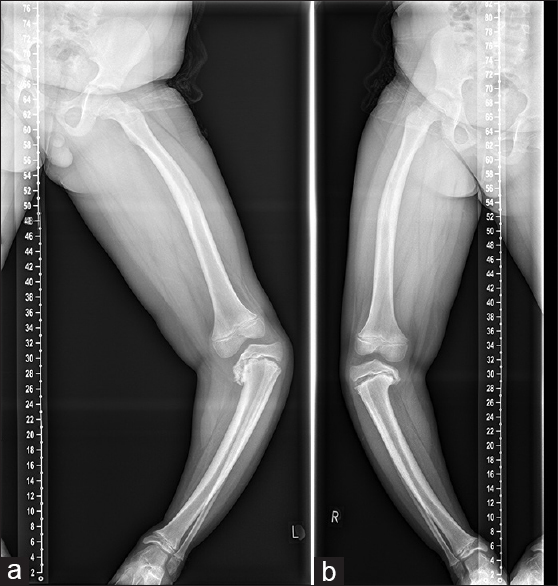 Aims: Severe infantile Blount's disease can result in a challenging multiplanar deformity of the proximal tibia with intra-articular and metaphyseal components. We describe our results using the Taylor's spatial frame (TSF) for acute tibial hemiplateau elevation combined with gradual metaphyseal correction in patients with severe infantile Blount's disease with an associated physeal bony bar. Patients and Methods: Eight patients (ten knees) underwent tibial hemiplateau elevation and metaphyseal correction from 2012 to 2016. We undertook a retrospective case note and radiographic review of clinical and radiographic outcomes. The mean age at the time of surgery of was 11.7 years and the mean length of follow-up was 18.2 months. Results: Improvement in radiographic parameters was seen in all patients. The mean tibiofemoral angle improved from −28.3° to −5.9° postoperatively. The angle between femoral condyles and the tibial shaft improved from the mean of 56.3° to 90.3°. The joint depression angle was also seen to improve from the mean 47.4° to 9.8°. No significant complications were seen. Conclusion: This technique is effective in correcting the complex deformity encountered in severe infantile Blount's disease. Use of the TSF may provide certain advantages in comparison to previously described approaches. Context: Osteotomies in several parts of one long bone are recommended for correction of a long, curved, and wide-angled deformity. 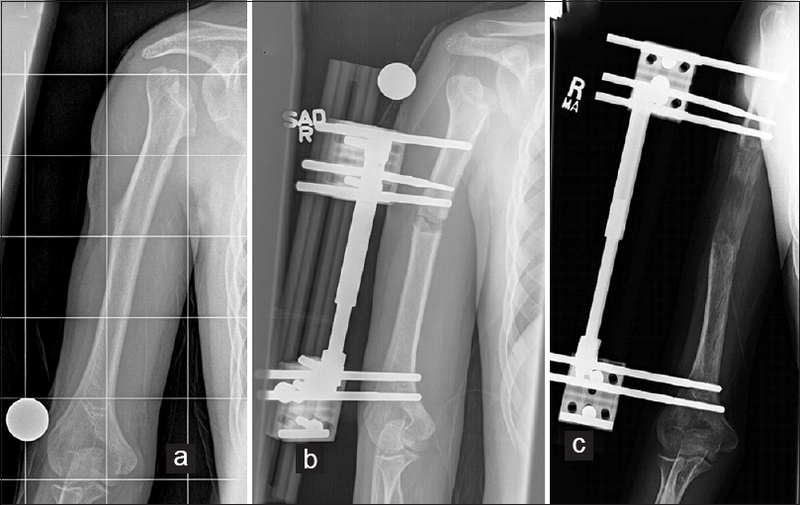 Hexapod external fixators (HEFs) allow for the single-stage correction of multiplanar deformity, but they are heavy, expensive, and requires continuous management of 12 struts, if at more than one level. Aims: We proposed the use of springs with HEF to support the intermediate ring. 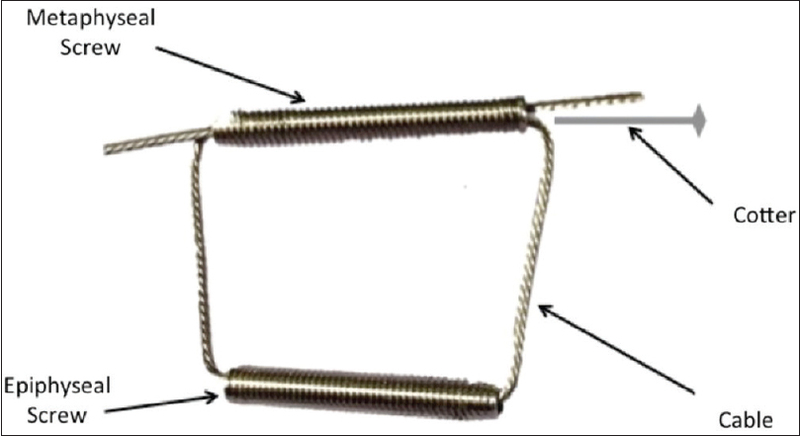 Deformity between the proximal and distal rings is corrected using one HEF, and the intermediate fragment is automatically corrected by the tension of the springs. Settings and Design: This was a retrospective descriptive study. Subjects and Methods: We treated seven males and eight females with 17 affected limbs. Four patients with familial hypophosphatemic rickets, five posttraumatic deformities, two osteogenesis imperfectas, three fibrous dysplasias, and one neurofibromatosis were included. The mean preoperative angle between the most proximal and distal fragments was 62.5°. First, small distraction at each level was initiated with one HEF fixed to the most proximal and distal rings, and Ilizarov hinges applied between the proximal and intermediate rings. Then, a set of three springs was applied for each interval between the rings. Gradual correction using HEF was performed, considering only the axes of the proximal and distal bone fragments. Results: Good alignment was achieved in all patients without severe complications. The mean correction period was 5.5 weeks and mean fixation period was 33.8 weeks. Conclusion: Combination of HEF and springs is capable of correcting severe deformity. 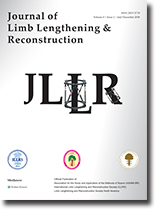 Background: External fixation utilizing hydroxyapatite (HA)-coated half pins has produced excellent clinical results revolutionizing the field of limb lengthening and deformity correction surgery. Removal of these pins is a painful patient experience that may be best conducted under anesthesia. Purpose: The current study documents how a deformity practice removes these external fixators (frames) under anesthesia. We asked: (1) How much anesthesia is needed for frame removal? (2) How effective was this protocol in controlling patient pain? (3) How did patients taking narcotic medications at the time of frame removal differ from those not taking narcotics during frame removal surgery? Patients and Methods: We prospectively recorded data during the removal of 53 consecutive external fixators that used HA-coated half pins including the use of pre operative narcotics at the time of frame removal, location and complexity of frames, type and dosages of medications administered, and adequacy of anesthesia. Results: All patients were managed with a combination of midazolam, propofol, fentanyl, and ketamine. Anesthesia was graded as good to excellent in 91% and unsatisfactory to poor in 9% of cases. The preoperatively medicated group was administered significantly less fentanyl (P = 0.020) and had significantly more frames located about the ankle and foot (P = 0.049) than the preoperatively non-medicated cohort. Conclusions: IV sedation administered by an anesthesiologist in the operating room provided adequate pain control to perform fixator removal and pin site debridement in most cases. External fixation used for foot and ankle reconstruction may provide a more painful experience for patients. Background: Rotational deformities of the femur and tibia are some of the most common orthopedic alignment problems in the lower extremity. In-toeing and out-toeing are common complaints seen by pediatric orthopedic surgeons as well. The idea of guided growth to correct axial rotation deformities in children is appealing. The purpose of this study was to investigate this concept and to test it in a large animal model taking advantage of the human like dimensions and biomechanics. Method: To generate axial-rotational growth we tether the growth plate on both sides at a fixed inclined angle on each side a cable with two screws. This construct was called the Percutaneous Progressive Derotator (PPD). Eight calves, two-month old, four male (50%) and the other four female, were used as models. The PPD device was implanted at the distal physis of the right metacarpal in an external rotation configuration, leaving the left side as control. The PPD device was left in for 3 months and was then removed. The total followed up was 2 years and 3 months. Results: The hypothesis that guided growth was possible in large animals has been confirmed. Rotation of 24° average were achieved in the right metacarpus of the growing cattle (P < 0.001), using the torque generated in the growth plate by the PPD. Loss of bone stock is a common problem in revision arthroplasty, specifically in large distal femur replacements (DFRs) after tumor resection. It can lead to worse functional outcomes and increased risk of revision procedures. Restoration of bone using distraction osteogenesis (DO) with an intramedullary nail may be an appropriate solution for this problem, especially in younger adults who may require future surgical interventions. In this series of three patients, we describe the successful use of DO through an internal device to address bone loss after a large osseous resection and revision endoprosthetic reconstruction. Bone stock was restored with a combination of lengthening and bone transport using a multistage revision strategy: removal of existing hardware, treatment of infection if present, lengthening of proximal femur with a temporary antibiotic spacer in the distal femur, and reimplantation of a definitive DFR after bone stock restoration. A magnetically actuated internal lengthening intramedullary rod was utilized to perform the proximal femur osteoplasty. 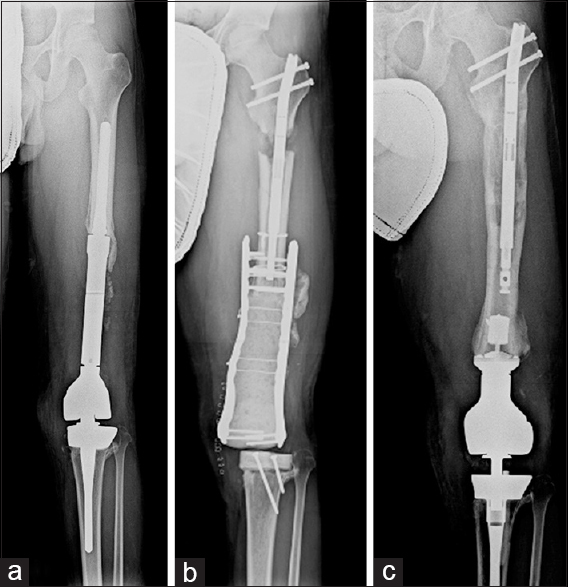 Conversion to a definitive weight-bearing DFR was achieved in two patients; one patient required an above-the-knee amputation for chronic osteomyelitis which could not be controlled after numerous debridements and courses of IV antibiotics. In this patient, the infection could be eradicated from the lengthened bone, the regenerate bone served to provide length to the amputation stump and fully remodeled to provide full weight-bearing and prosthetic use. DO was successfully used in three patients for revision DFR and bone stock restoration. 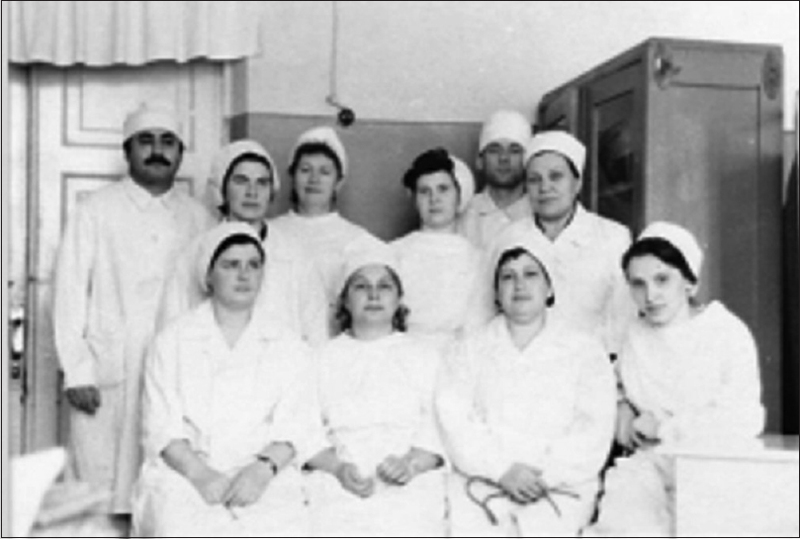 In one of the two patients who required revision surgery for infection, amputation was ultimately required. All three patients achieved successful bone regeneration. 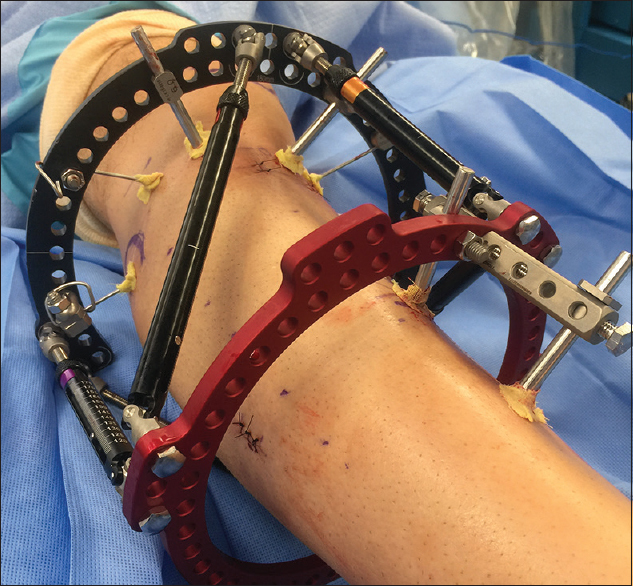 Monolateral external fixator (MEF) has been commonly used for limb lengthening in both upper and lower extremities. Since MEF can only lengthen or shorten the bone, sagittal, coronal, and torsional deformities need to be corrected acutely at the time of MEF application. Acute correction, particularly torsional correction, may endanger the radial or peroneal nerves. Gradual correction of torsion may be safely achieved using a circular external fixator (CEF) frame. We present a case study of humeral lengthening with derotation to describe a technique, whereby it is possible to first lengthen with MEF and then derotate with CEF. This is a case report of a 14-year-old boy with a history of neonatal sepsis and growth arrest of the proximal humerus that led to a short right humerus and loss of external rotation. Humerus lengthening was achieved (6.6 cm) using MEF. Conversion to CEF was done after the distraction phase and prior to regenerate bone consolidation. Two 2/3 rings were connected to the proximal and distal fixation half-pins, and then the six connecting struts were added. The rotation deformity correction was then performed gradually to achieve 60° of external rotation. The described technique to convert the MEF into CEF is versatile and can be employed in the clinic safely and without sedation.